SOUTHFIELD, Mich. – Over 80 teams from 10 states and seven other countries will compete in the 16th annual Robofest World Championships on Saturday, May 16, from 9 a.m. to 4:30 p.m. at the Don Ridler Field House, Lawrence Technological University, 21000 West 10 Mile Road, Southfield. Admission and parking are free. Robofest is a competition of autonomous robots – computer-programmed to act independently and not remote-controlled – that encourages hands-on learning of science, technology, engineering, and math, known as the STEM subjects, as well as computer science. Teams compete in the junior division (grades 5-9) or senior division (grades 9-12), using a variety of computer programming languages. Robofest originated at LTU, and this year’s competition includes more than 2,000 students from Michigan and nine other states (Ohio, Texas, Minnesota, Florida, Hawaii, California, Missouri, Indiana, and Washington) and seven other countries (Canada, Korea, China, India, South Africa and Egypt, and Ghana). The challenge of this year’s RoboBowl game is to build an autonomous robot to detect and knock down four pins (water bottles) by bowling tennis balls. In addition, the robot has to measure the height of the black rectangle shape on the table. The Robofest World Championships include the Exhibition category, a science fair-style competition, in which students demonstrate their imagination and creativity through robotics. 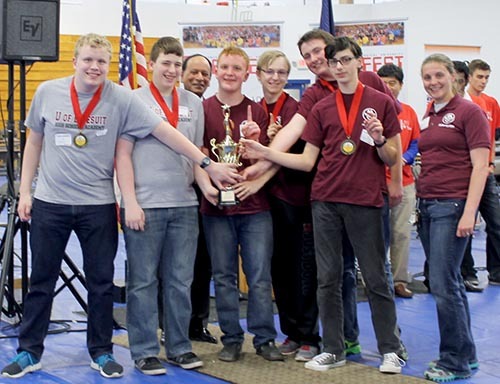 The University of Detroit Jesuit High School team RoboCubs, which took first place in the Senior Exhibition category at the Robofest Michigan Championships, is one of 25 Michigan teams that have advanced to the World Championships on May 16. Left to right are ninth-graders Luke Adams, Christian Commen, Grayson Huldin, Ian Wilson, Ben Godfrey, and Jonathon Hopkins. LTU President Virdiner Moudgil is in the back and coach/teacher Jennifer Wint is at right.